Adding burnish to his reputation of being a political maverick, cricketer-turned politician, Imran Khan, has done something unheard of in Pakistani politics. He has called out 20 of his own party (PTI) members for horse-trading and shamed them publicly.Naming and shaming corrupt politicians has traditionally been a ‘no-go’ area, a sort of terra incognita, in Pakistan’s arcane and privilege-oriented political culture. 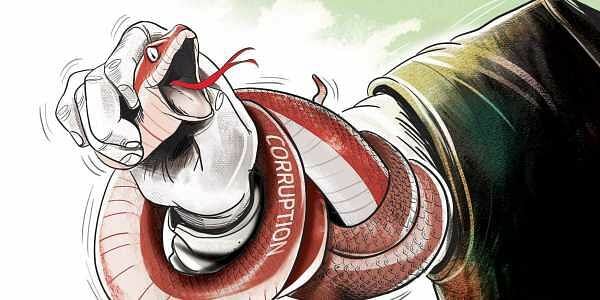 Endemic corruption in politics—and its use as a money-making machine—has long been an accepted fact ignored with a shrug as a necessary evil. But Imran had entered politics as an iconoclast sworn to ridding it of its dynastic nepotism and corruption. He has remained steadfastly committed to his goal, taking on, in the process, the two main political dynasties, the Bhuttos in Sindh and the Sharifs in Punjab, who, between them, have hogged Pakistan’s political fortunes for exactly three decades. Imran has never relented in his crusade of naming and shaming the corrupt Bhuttos and Sharifs for making politics a byword for corruption and nepotism. Zulfiqar Ali Bhutto may have founded the People’s Party (PPP) but since his daughter Benazir’s yet-unresolved mysterious murder in 2007, PPP has been the personal property of her Machiavellian husband, Asif Ali Zardari, whose name is synonymous in Pakistan with corruption. It is Zardari—who shares the dubious pedestal of Pakistan’s richest politician with disgraced PM Nawaz Sharif—whose billions are suspected to have been used for horse-trading—the Pakistani terminology for vote-buying—in last month’s elections to the Senate, parliament’s upper chamber. Zardari’s PPP managed to get two of its candidates elected to the Senate from the province of KPK, led by Imran’s PTI, notwithstanding its minuscule presence of seven members. Imran minced no words in castigating Zardari for his vote-buying spree, while also lambasting his own parliamentarians for catering to Zardari’s whims and selling their vote for 40 million rupees each. Imran has warned his partymen that their failure to absolve themselves of corruption charges against them would lead to their expulsion from the party. Imran has not only named his party members for corruption but also dared Zardari and Sharifs to borrow a leaf from him and unmask the evil- doers in their parties.Imran knows, however, as does anybody else with even a spotty knowledge of Pakistani politics’ symbiosis with corruption that neither Zardari nor Nawaz has Imran-like gall to take any of their henchmen to task for corruption. They wouldn’t, or couldn’t because they are corrupt up to their eyeballs themselves. Both rose from humble origins but have made tons of money in politics, not only for themselves but also for the corrupt minions around them. While Zardari has, so far, dodged the accountability bullet, Nawaz has been facing the music since he was shown the door by the country’s Supreme Court last July. Last week, the apex court added insult to Nawaz’s injury by declaring him unfit for active politics for life because he doesn’t pass the muster of basic honesty and uprightness essential to enter the parliament. He, along with his sons, daughter and son-in-law, is also being tried in the Accountability Court on charges of nepotism, corruption and money-laundering. Imran’s role is being duplicated by Chief Justice (CJ) Saqib Nisar of the apex court in his own domain and style. Justice Nisar is not merely lancing corrupt politicians like a dragon-slayer, he’s also imparting an unheard of meaning of judicial activism to his office. Since snuffing out Nawaz’s career in politics, the CJ has also donned the garb of a human rights activist and a defender of the common man’s rights long abused by corrupt politicians and pseudo-leaders of Nawaz’s and Zardari’s ilk. His piercing gaze has been focused, in particular, on medical colleges and hospitals where evil practices have long ruled the roost. He has ordered private medical colleges to reimburse to their students exorbitant fees charged from them on flimsy and dubious grounds. Justice Nisar hasn’t flinched from shaming erring bureaucrats for serving corrupt political masters. He has pulled no punches in berating chief ministers of provinces for failing to serve the people electing them and has warned them that he’d be there to shield the public interest against their vile ways and those of their crony civil servants. In his latest jab at the heart of Pakistan’s well-heeled VIP culture, CJ Nisar has axed police protection for hundreds of bogus VIPs; as many as 13,600 policemen have been unshackled from VIP duty.What Pakistan is witnessing under an iconoclast Imran, and a proactive judicial crusader, like CJ Nisar, is an entirely new phenomenon. Up until these two donned the mantle of championing the people’s rights, politicians were deemed their sole legitimate guardians. Politics was a game of monopoly that only the privileged could play. Imran is sworn to changing that by imparting politics the colours of cricket, open to all. To his credit, he has a zealous partner in CJ Nisar ready to chip in with the cover of judicial activism. But not everyone is happy with what these two are doing. They have critics and detractors aplenty, especially in the traditional feudal lobbies, whose partisans blame them for acting as proxies of Pakistan’s much-reviled ‘deep state’. Of course the last word in the ongoing drama would come from the people of Pakistan. General elections, in three months, should pronounce, for good, who has their trust: Imran and Nisar or Zardari and Nawaz. Hold your breath, everyone; the curtain is still up.